Every year, on the evening of October 31st, millions of children in the Western world paint their faces, dress up in costumes, and go door to door collecting treats. The adults often decorate their houses with ghostly figures, carve scary faces on pumpkins, and put candles in them to create "Jack-O-Lanterns." Unfortunately, among the millions of people indulging in this custom, many are also Muslims. In Islam, any practice which does not have its origins in the Qur'an (Divine Scripture) and The Sunnah (Prophetic Tradition) is totally prohibited. 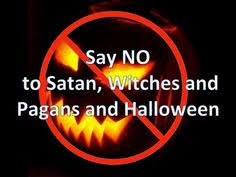 This applies to many Pagan practices such as Halloween, Valentine's Day etc. Virtually all Halloween traditions are based either in ancient pagan culture, or in other Religions. From an Islamic point of view, they all are forms of idolatry (shirk). As Muslims, our celebrations should be ones that honour and uphold our faith and beliefs. How can we worship only Allah, the Creator, if we participate in activities that are based in pagan rituals, divination, and the spirit world? Many people participate in these celebrations without even understanding the history and the pagan connections, just because their friends are doing it, their parents did it ("it's a tradition! "), and because "it's fun!" So what can we do, when our children see others dressed up, eating candy, and going to parties? While it may be tempting to join in, we must be careful to preserve our own traditions and not allow our children to be corrupted by this seemingly "innocent" fun. When tempted, remember the pagan origins of these traditions, and ask Allah to give you strength. Save the celebration, the fun and games, for our Eid festivals. Children can still have their fun, and most importantly, should learn that we only acknowledge holidays that have a religious significance to us as Muslims. Holidays are not just excuses to binge and be reckless. In Islam, our holidays retain their religious importance, while allowing proper time for rejoicing, fun and games. As Muslims we should not participate or condone such evil customs as Halloween. It is the duty of every Muslim parent to educate their children to refrain from practicing falsehood and not to imitate others in their futile customs and festivals. If the children are taught to be proud of their Islamic heritage, they themselves will, if Allah wills, abstain from Halloween and other non-beneficial celebrations. As Muslims, let us be convinced that our Deen is indeed the best and purest way of life…so do not say "Hello" to Halloween! Very often our past learning experiences inhibit our development and growth. We sometimes are so discouraged by setbacks in life that we don't explore new avenues of progress. One of the secrets of success is that we should not fear failures. Remember that "failure" is NOT the opposite of "success", it is part of! Whilst failure and success seem to be two separate concepts that may appear to contradict each other, they are actually to be seen as two sides of the same coin and thus complimenting each other. Often it is said that you will never really taste the sweetness of success until you've tasted the bitterness of failure. No doubt failure is a reality but Allah Ta'ala has granted each of us amazing and enormous potential to achieve and progress through the challenges of life provided we try and work hard at achieving. We cannot change a divine decree but that does not mean we should become hopeless in life after some deterrent. We have to keep trying hard and working as well as praying and trusting in Allah Ta'ala. Failure is part of learning; we should never give up the struggle in life. The Noble Messenger of Allah, Muhammad (peace be upon him) was an orphan, "unlettered", meager means, tortured and persecuted and yet never gave up in his efforts and struggle to achieve. Muhamamd (peace be upon him) reached such heights unparalleled in the history of humanity. 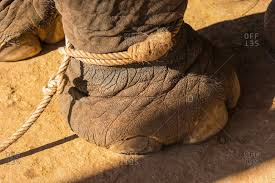 So the next time you encounter any hurdle, remember "The Elephant's Rope".